I’m reposting an entry from February 2015 with some new commentary as prologue. We have shown that the rate of sightings is the strongest indicator to infer extinction, and too much information about the quality of the sighting can actually be detrimental. Ideally a sighting record would be a list of certain and uncertain sightings only. I’m curious as to how this model might treat the ivorybill, using the sighting data compiled and analyzed by William C. Hunter in the U.S. Fish and Wildlife Service’s Recovery Plan, a document with which many extinction modelers seem to be unfamiliar. An example of a species with a high false detectability is the ivory-billed woodpecker. After 2006, when the US Fish and Wildlife Service offered $10,000 for information leading to an ivory-billed woodpecker’s nest, it was ‘observed’ 14 times and audio recorded 300 times. Nonetheless, the reward remained uncollected (Newton 2009). Lee, T. E. (2014), A simple numerical tool to infer whether a species is extinct. Methods Ecol Evol, 5: 791–796. Neither of these papers applied the models described to the ivorybill, and I’m not commenting on the validity of the models themselves. I’m pointing to how peer-reviewed literature can sometimes function as an echo chamber in which inaccurate information gets repeated as fact. While it’s true that extensive searches have failed to obtain indisputable proof, the Luneau video, however controversial, cannot be characterized as a “pixelated image”. There were many more sightings in Arkansas and elsewhere, and in Arkansas, numerous kent-like calls and double knocks were heard and recorded over several seasons. The book by Newton cited in Lee is Hidden Animals: A Field Guide to Batsquatch, Chupacabra, and Other Elusive Creatures, clearly not a serious scientific treatment of the ivorybill and apparently not a very well-researched one. There were in fact 15 Arkansas sightings between 2004 and 2005 and 14 in 2005-2006. The reward, which was for $50,000, applied to Arkansas only and was offered by the Nature Conservancy, not the USFWS, in June 2006. The source of the claim that audio was “recorded 300 times” is not clear, nor is the meaning. Inaccuracies aside, it’s an enormous logical leap to base an assertion about high false detectability on the inability of an unknown number of bounty hunters to locate a nest in ~500,000 acres of forest. It may well be true that the ivorybill is more prone to false detectability than some other species; its iconic status makes this seem likely. It’s also true that there have been a number of organized searches for the ivorybill and that the number of sightings has increased as a result of publicity and search activity, at least during the first decade of this century. Nevertheless, many of the records between 1944 and 2003 listed in the USFWS Recovery Plan were unrelated to publicity or organized searches and were incidental to other activities, including bird surveys. In addition, the Recovery Plan tally included some qualitative analysis of the sightings, and an unspecified number of reports were excluded as probable false detections. I find it odd that Appendix E of the Ivory-billed Woodpecker Recovery Plan is seldom if ever referenced in the recent literature, including Birdlife International’s species account (which I’m honored to say does reference the post below). It’s an official government report and is the most extensively researched document of its kind. I suspect that many readers will be unfamiliar with it and think it merits quoting at length; I’ve bolded some important passages. I encourage people to click on the link above and read the rest. Here, a potential encounter is defined as a report not easily explained as something other than an Ivory-billed Woodpecker on the basis of description of the bird, the type of habitat in which it was encountered, and distribution. After the Arkansas announcement was made, post-1944 reports were compiled prior to the 2005 announcement of an Ivory-billed Woodpecker being sighted in Arkansas. A map was produced of these potential encounters in Service brochures. These potential encounters were based on those discussed by Jackson (2004) or otherwise in Service files as “probably reliable,” defined here as not obviously another species. A review of other published literature and files maintained by some State working groups included other potential encounters that are cited and used in this treatment (both before and after 1950). Excluded from further consideration were reports that likely described other species (especially Pileated, but also Red-headed and sometimes other woodpecker species), as well as those reports outside the historical range of the species (as depicted in Tanner 1942) and in unlikely habitats such as golf courses and backyards. The reports between 1945 and 2005 considered further vary in detail, with some accepted based solely on the credibility and reputation of the observer. 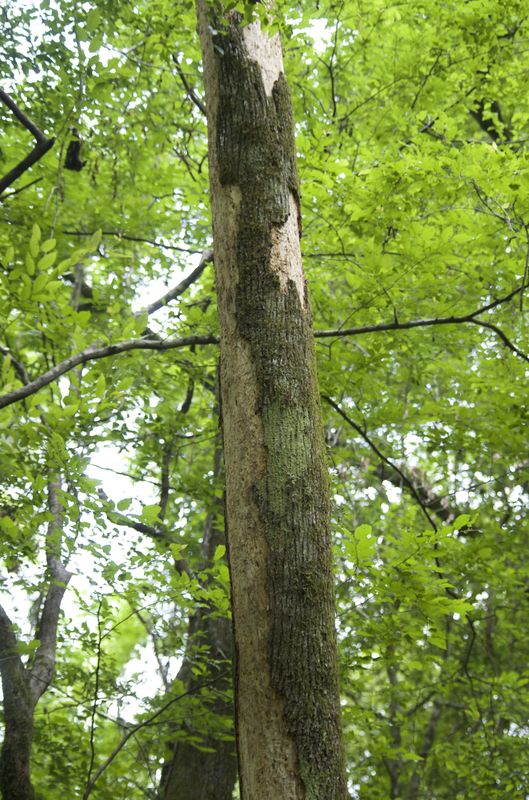 Reports since April 2005 (i.e., the Arkansas announcement) are similarly treated, but at least one diagnostic field mark had to be observed (most often the white trailing edges on a flying or perched large woodpecker). It is important to understand the type and level of documentation accepted for this species’ persistence at the time when most collecting of specimens began to trail off (i.e., after 1900) compared with those reports which were accepted without question previously. While most previous treatments break down reports by State, here it is believed that important insights can be made by comparing reports, type and level of documentation, by decade starting with the 1800 and ending with the present. References for those reports besides those of Tanner himself prior to 1940 are provided in Tanner (1942, with cross-reference to location on his maps, his figures 3-10) and are so noted here. The number of locations with Ivory-billed Woodpecker reports peaked between 1880 and 1910, the same period when most specimens were collected (Figures 1, 2). The number of locations with potential reports after 1940 generally dropped below the number of locations with all reports between 1900 and 1940. However, when including only potential encounters between 1900 and 1939, the range in number of locations among decades was roughly similar to the number of locations with potential encounters in the decades between 1940 and 2009, only dropping below 10 locations during the 1990s. The number of locations within each decade with multiple reports among years never exceeded 10 per decade prior to the extensive efforts underway after 2005 to search for this species. Prior to 1940, only a small percentage of locations from decade to decade provided the source of reports from multiple years within any one decade, ranging from 12 to 28 percent of all locations with birds reported within each decade (Figures 3, 4). After 1940, there was a slight increase in the percentage of locations with multi-year reports in the later decades, ranging from 9 to 51 percent of all locations with birds reported within each decade. Despite this increase in locations with reports from multiple years there was no definitive documentation of persistence at any of these locations. Similarly, a very low percentage of locations with reports spanning more than one decade is documented in the historical record, but again with a slight increase during the latter decades (Figures 5, 6). Reports continue to come from most of Tanner’s regions into the present day with an obvious shift from those regions that included Florida to regions elsewhere (Figure 7). In summary, there is no evidence that the Ivory-billed Woodpecker was ever widely or consistently relocated in the same areas from year to year or from decade to decade prior to 1940, despite the impression one may have about birds at the Singer Tract during the 1930s. Actually, during Tanner’s study the chore in locating birds often took days or weeks even where pairs or family groups were known to occur from previous years (and actually only one nesting pair at John’s Bayou was consistently relocated during his entire study). Whether the birds were truly more nomadic than previously thought, or whether the low percentage of repeated locations historically has been due to the search patterns of ornithologists and collectors is unclear. What is clear is that the present pattern of reports that do not effectively document occurrence of the species has been repeated from decade to decade for more than a century and that the number of locations with potential encounters within the same decade has varied little since the 1870s. Whether or not many or all post-1944 reports pertain to actual Ivory-billed Woodpeckers will continue to be debated in some circles, and it also is possible that some of the reports dismissed for purposes of this treatment perhaps should not have been discounted so lightly. However, the pattern of credible-sounding reports accepted for this treatment from locations without firm documentation was from decade to decade slightly lower between 1940 and 2009 than the pattern recorded between 1890 and 1939. Most interestingly, the exceptional increase in locations with potential encounters during the present decade is on the surface similar to what was recorded during the 1930s, given both of these decades experienced a notable increase in amount of effort to firmly document the persistence of this species (with similar results despite substantially fewer observers involved in the 1930s than in the present decade). One caveat about this material: the specific information in Appendix E is potentially subject to change in the future, but the overall patterns are likely to stay similar or the same. Here’s the February 2015 entry. Chris pointed out that there are many other species on the Red List that fall into a similar category with many unverified reports but in more remote habitats and nowhere near the search effort that has been expended on the ivorybill. While there’s some validity to this assertion, I think the reality is considerably more complex and that the ivorybill is in fact sui generis. Roberts, D. L., C. S. Elphick, and J. M. Reed. 2010. Identifying anomalous reports of putatively extinct species and why it matters. Conservation Biology 24:189–196. As species become very rare and approach extinction, purported sightings can stir controversy, especially when scarce management resources are at stake. We used quantitative methods to identify reports that do not fit prior sighting patterns. We also examined the effects of including records that meet different evidentiary standards on quantitative extinction assessments for four charismatic bird species that might be extinct: Eskimo Curlew (Numenius borealis), Ivory-billed Woodpecker (Campephilus principalis), Nukupu`u (Hemignathus lucidus), and O`ahu `Alauahio (Paroreomyza maculata). For all four species the probability of there being a valid sighting today, given the past pattern of verified sightings, was estimated to be very low. The estimates of extinction dates and the chance of new sightings, however, differed considerably depending on the criteria used for data inclusion. When a historical sighting record lacked long periods without sightings, the likelihood of new sightings declined quickly with time since the last confirmed sighting. For species with this type of historical record, therefore, new reports should meet an especially high burden of proof to be acceptable. Such quantitative models could be incorporated into the International Union for Conservation of Nature’s Red List criteria to set evidentiary standards required for unconfirmed sightings of “possibly extinct” species and to standardize extinction assessments across species. Data were from Tanner (1942), Hahn (1963), Jackson (2002, 2004), Fitzpatrick et al. (2005), Hill (2006), and Floyd (2007). Some conclusions: For the Ivory-billed Woodpecker, the prior sighting record suggests that even by the time of the first controversial sighting, the species was relatively unlikely to remain extant (ca. 21% chance), regardless of the level of evidence (physical or independent expert opinion) used…the effect on the predicted extinction date will depend on the details of the sighting record. Including controversial sightings will, by definition, move expected extinction dates forward in time. An ever-increasing burden of proof should be required with increasing time since the last verified sighting. The burden of proof also should be greater when there is a pattern of frequent sightings prior to the last accepted record and lower when long periods between sightings are common in the historical record. A second paper published in 2012 reached the same conclusion using 39 sightings “classified as certain and 29 classified as uncertain”. Fangsheath’s observation about the impact of Tanner’s narrative on future search efforts is profoundly important. Tanner’s ideas about habitat, which were in large part a product of his cultural background and the “myth of the frontier”, hardened over time. In later years, he ignored some of the caveats he set forth in his own monograph. But even his approach to reports from the 1930s reflected a set of beliefs about habitat requirements that had no scientific basis. Many people, myself included, are prone to reflexively accepting these assumptions about “habitat quality” because the conventional wisdom is so deeply engrained. Fangsheath also reminded me that in the years before Tanner, the species was being written off and had been for decades. Florida was believed to be the last stronghold; the Singer Tract and Atchafalaya basin were not considered, nor were the large tracts of overcup oak/water hickory forest (where Beyer found ivorybills in 1898), many of which were untouched until the 1940s. Unlike the Singer Tract, these areas were often roadless and very difficult to penetrate; the Tract was bisected by a road, had few deep bayous, and was largely free of undergrowth, making it much easier to search. I’ve already discussed Tanner’s difficulty in finding ivorybills anywhere besides John’s Bayou. In this context, it’s worth noting that Bick’s 1941 sighting (from his car on Sharkey Road) involved two birds feeding in a lower lying “ash flat” in which overcup oak predominated. In addition to these conceptual flaws, the papers grossly underestimate the number of post-Singer Tract encounters within the historic range. While it is impossible to quantify the controversial reports, it’s clear that the 26 or 29 referenced in the studies are the tip of the iceberg. There are well over four times that many on record for the 1944-2003 time period. And no doubt, numerous encounters never made it into the literature. I initially posted a brief comment about this on Facebook and ibwo.net, with a link to Jerome Jackson’s 2002 Birdwatching Daily article listing 20 pre-Arkansas and post-Singer Tract encounters (some just auditory and one from Cuba) and a reference to Michael Steinberg’s Stalking the Ghost Bird catalogue of 85 sightings during the same time frame. A commenter wrote, “Yes but no confirming photos”. That also led me to think it would be worthwhile to explore this subject in a somewhat more depth, since there is physical evidence, albeit contested, related to several post-Singer Tract and pre-Arkansas reports. Before turning to the physical evidence, it’s worth reiterating that the 1944 date for the last “verified sighting” is fundamentally flawed and arbitrary. The 1944 date is for the “Say Goodnight” encounter that involved artist Don Eckelberry and two local boys, Billy and Bobby Fought, and the purported last lone female IBWO in the Singer Tract. This poignant story was retold in The Race to Save the Lord God Bird, and it has become central to the popular lore about the species. There’s no doubt that the encounter took place, and Eckelberry no doubt believed that the bird was the last of her kind. Roger Tory Peterson apparently received and accepted a report that a single bird, presumably the same one, was still present in 1946. Tanner was likely aware of this and had an additional reason to think that birds persisted in the Tract well after 1944. His papers include a letter stating that Singer Tract game warden Gus Willett saw a pair in November 1948 at North Lake #1 (I have been unable to identify this lake). According to the letter, the “[b]irds are moving over a much larger area than formerly.” The letter mentions that there had been several other sightings during this time period. There’s no reply from Tanner in the archives and no further correspondence about the Singer Tract birds. It appears that this is the letter from Tanner’s former student, Arthur MacMurray, that is referenced in Jackson, but Jackson’s account does not mention Willett, who would have been familiar with ivorybills. The strong possibility that a pair of birds remained in the Tract for more than four years after it was cut should itself raise questions about Tanner’s narrative. Jackson’s list of 19 US reports between 1944 and 2003 was undoubtedly not intended to be comprehensive (and his book includes many others). Instead, it focuses on sightings by professional ornithologists and/or people who were familiar with the species. These include: Allan Cruickshank, John Terres, Herbert Stoddard, John Dennis, Davis Crompton (Dennis and Crompton studied ivorybills in Cuba), Whitney Eastman, and William Rhein. Jackson doesn’t mention it, and was perhaps unaware when he wrote the article, but Rhein had filmed the Imperial Woodpecker in Mexico several years prior to his 1959 Florida ivorybill sighting. It strains credulity to think that every one of these experienced observers, most or all of whom were familiar with the species and all of whom knew pileateds well, would be mistaken. Jackson points out that Terres kept his sighting to himself for more than 30 years out of “fear of being scorned.” Such was the climate surrounding ivorybill claims, even in 1955. Steinberg lists 85 sightings between 1944 and 2003. His list includes most, if not all, of Jackson’s reports, breaking them down into individual incidents. Jackson treated repeat encounters in the aggregate. Nonetheless, most of Steinberg’s reports do not appear on Jackson’s list. Many of them are from less illustrious sources and quite a few are anonymous, but some of them are from game wardens, field biologists, and graduate students in ornithology. The Ivory-billed Woodpecker Recovery Plan, prepared by the U.S. Fish and Wildlife Service and completed in 2010, includes an even more detailed compilation of records, some of which are of course also included in Jackson and Steinberg. It lists approximately 100 reports of varying quality between 1944 and 2003. Some of these are aggregates, involving multiple observations. The number of observations is sometimes enumerated and sometimes characterized as “numerous”, “multiple”, or “several”, so it’s impossible to arrive at an accurate tally, but the total almost certainly exceeds 150. Although the Steinberg and the Recovery Plan compilations are more extensive, they are undoubtedly far from comprehensive. For starters, the climate of intimidation around reporting ivorybills was strong enough to deter John Terres in 1955, and that climate of intimidation only grew more toxic over time, as the Big Thicket and Fielding Lewis incidents, not to mention the battle over the Arkansas reports, make clear. In addition, there’s good reason to believe that countless reports from local people, hunters, and amateur birders have been discounted, dismissed, or ignored by authorities, at least prior to the “rediscovery”. Steinberg writes of his first visit to the Louisiana Department of Wildlife and Fisheries Baton Rouge office in 2003,“ . . . few people took the book, or more important the larger issue very seriously. The typical response from many in the office, other than Nancy Higginbotham, seemed to be, ‘Don’t you have anything better to do?’” (Higginbotham claimed two sightings, one of male in 1986 and one of a female in 1987, both in the Pearl River area.) We’re personally familiar with several instances in which reports were dismissed or ignored. One involved the landowner in our old search area, who came forward after the Kulivan sighting and was deeply offended by the way he was treated. As far as I’m aware, no one has done a comprehensive review of records committee submittals within the historic range of the ivorybill; I know of one such submittal from Texas in 2002 that came from unsuitable habitat, outside the historic range, but there may well be others that are more robust. I’d like to turn to three examples of physical evidence obtained in the post-1944 era. Some of this is fairly well known – the Agey and Heinzmann feather and the Fielding Lewis photographs. The other is somewhat more obscure, but no less interesting for being so. The Agey and Heinzmann observations took place between 1967 and 1969, in Polk County Florida. They obtained two recordings that Tanner dismissed. There was evidently some very poor communication about it that was compounded by an obvious error on Agey and Heinzmann’s part. They mistakenly thought that calls on their first clip were consistent with some ivorybill sounds from the Singer Tract; they clearly are not. The second clip, which is dominated by a Red-shouldered Hawk, recorded March 3 1968, does have some faint kent-like sounds, but the quality is extremely poor. They are most easily heard on the amplified version that begins at 3:14. The RSHA calls were not what interested Agey and Heinzmann, but they failed to make this sufficiently clear. Agey, H. N., and G. M. Heinzmann. 1971a. The Ivory-billed Woodpecker found in central Florida. Fla. Nat. 44 (3):46–47, 64. Agey, H. N., and G. M. Heinzmann. 1971b. Ivory-billed Woodpeckers in Florida. Birding 3:43. To the best of my knowledge neither publication is available online at this time. The next event, chronologically, started with a series of encounters in east Texas in the late 1960s. John Dennis obtained a recording that Tanner initially dismissed, in part for the patently absurd reason that a Pine Warbler is also heard on the clip, but later described as “a real mystery” when confronted with the sonograms and analysis that were suggestive of ivorybill. That recording is now catalogued as IBWO. Additional slides, taken in 1970 in east Texas by a man named Neal Wright, were turned over to the Museum of Natural History in Philadelphia which also houses the Fielding Lewis photographs. These were made public after the rediscovery, and since writing this in 2015, I obtained permission to post them on the blog. They show what appears to be a female Ivory-billed Woodpecker in a nest cavity. When I first viewed the Wright photographs, I was quite skeptical, but later, I was struck by the resemblance to this image from the Singer Tract. Wright was apparently quite a local character, and I remain somewhat suspicious, as he may have had ulterior motives; however, the similarity to one of the unpublished images from the Singer Tract is strong, and in the pre-internet era, it seems unlikely that a Texas woodsman would be familiar with any of the ivorybill images that did not appear in Tanner’s monograph. The Fielding Lewis photographs, taken in South Louisiana in 1971, are far better known, although Lewis wished to remain anonymous. His identity was not revealed until more than three decades later, and he was identified at the time only as “the Chief” (Jackson was unaware of his identity in 2004, though it was made public soon thereafter.) George Lowery presented these images at the American Ornithologists’ Union annual meeting and was attacked by many of his colleagues who deemed them to be a hoax. It’s worth pointing out that there have been hoaxes in recent years (these were swiftly and easily debunked), so there’s legitimate reason for skepticism about any claim. In the case of the ivorybill, however, skepticism has frequently been replaced by a virtually irrebuttable presumption of fraud (or error). The most common reasons given for believing that Lewis hoaxed the photos are that the bird is similarly positioned in both images (similarly but not identically, a neat trick with a specimen) and that the bill and feet are not visible. Bear in mind that these pictures were taken with a Brownie or Instamatic camera, and the quality is very poor. Nonetheless, I believe a foot is very faintly visible in both photos, positioned in a manner that would be expected of a live Campephilus woodpecker. I worked from scans of the originals and made some modest enhancements in Photoshop. Note also that in the first picture, both a cavity and bark scaling can be seen on the tree. Regardless of whether my analysis is correct, the foundation for claiming that these photographs were faked is shaky indeed – not only for the reasons Lowery gave but also because of Lewis’s reticence about revealing his identity, insistence on keeping the location secret, and lack of any discernible motive. The recovery plan mentions two other pieces of physical evidence. One is a feather that was purportedly found in a nest or roost cavity in 1985, and the other is a photograph supposedly taken in Georgia in 1975 (correction, 1965). It’s not my intention to fault the IUCN or to quarrel with the “possibly extinct” designation, although I think Bill Pulliam’s analysis of the Luneau video in light of Rhein’s Imperial Woodpecker film should be dispositive. My main purpose is to call attention to the fact that there’s considerably more evidence for survival than is popularly recognized or than appears in the scientific literature. There are multiple instances of people, often outstanding birders, hesitating to come forward with reports and hard evidence – for decades. Terres waited 30 years; in the cases involving physical evidence, only Agey and Heinzmann went fully public and identified themselves in making their claims; in Stalking the Ghost Bird, Steinberg includes detailed 2005 field notes written by a Louisiana “birder for more than forty years” who “has also worked as a contract ornithologist conducting bird surveys on rice and crawfish farms for more than ten years.” This individual too requested anonymity. To a significant extent, the shortcomings in the literature are directly related to the controversy that has surrounded this species for nearly a century (remember Mason Spencer who went so far as to obtain a permit and kill an ivorybill to prove the species persisted) and the accompanying climate of unhealthy skepticism that has, if anything, grown even more unhealthy since the rediscovery. This sets the ivorybill apart from other possibly extinct species. I’ll be heading for Louisiana at the end of the week and will post a trip report when I return. I’m still in mourning and adjusting to the loss of my friend. Thanks to all who have expressed appreciation for our work and a desire for it to continue. I’m sure Frank would have felt the same, and with that in mind, this will be the first of two or three installments discussing Pileated Woodpecker work on sweet gums that we’ve recently documented. After my December trip, Phil Vanbergen and John Williams retrieved the trail cam we had deployed on December 21. They took the camera to Frank’s house, reviewed the card, and found that two Pileateds had visited the downed tree on the 22nd and had scaled some bark near the base of a medium to large limb. Phil, who has spent time with me in the field and who has paid close attention to my approach to analyzing feeding sign, immediately suspected Pileated for this work, based on the appearance of the scaling and the characteristics of the bark chips. Rather than extract the images at that time, Frank and Phil opted to redeploy the camera. Although I had not yet seen the frames, many of my last communications with Frank, both on the phone and via email, touched on this subject. He was tickled by the fact that we’d anticipated and documented scaling activity on an untouched limb and was eager to get back out and see for himself. Sadly, that was not to be. Phil and I retrieved the trail camera on January 28. I had visited the site on the 26th and had noted some additional scaling consistent with what I’d expect for Pileated Woodpecker, although with some bark chips on the larger side. As it happened, the second round of scaling had taken place approximately three hours earlier, five weeks to the day after the first. In both instances, it appears that almost all the scaling was done by a female, although the image quality is too poor for me to be 100% certain. In both cases, the bird spent approximately 15 minutes on the trunk. It seems that squirrels (seen briefly at the beginning of the January series) are responsible for the modest quantity of scaling on the upper, less vertically oriented, part of the limb; this was my instinct at the time, and the idea is supported by the footage. The full time lapse sequences are at the bottom of the page. Phil extracted both sequences, and Steve Pagans created a slower version of the January 26th clip. The first four photos in the tiled mosaic series below were taken by Phil Vanbergen. I’ll go into more detail in subsequent posts, but for now, I have a few observations. This work has a distinctive appearance, what I’ve called a layered look to the edges, that is consistent with what I’ve previously hypothesized for Pileated. While some of the bark chips are on the large side for what I have ascribed to Pileated, none are anywhere near as large as the larger ones that that we’ve ascribed to ivorybill. In addition, the chips found at this location and at another where I suspect the source is PIWO, seem to be less uniformly large in size and sometimes show signs of being taken off in layers, which matches what’s visible on the limbs. The tree in question was no more than six months dead, and the bark at the edges of the scaled area remained tight; however, dormant sweet gum bark is in the midrange of tightness relative to other hardwood species. This is a decay class that Tanner associated with ivorybills not PIWOs, but it’s clear that Pileateds can and do scale very recently dead sweet gum limbs, at least in mature bottomland forests. Tanner’s photographs provide little guidance in terms of differentiating between Pileated and Ivory-billed Woodpecker work on high branches. I suspect he thought of his monograph as more epitaph than guide to identifying feeding sign. Nevertheless, his descriptions offer some clues. “Scaling, the Ivory-bill works steadily, removing all the bark for quite an area; one may work at a spot for an hour or more.” And for Pileateds, “What scaling Pileateds were observed to do was mostly on loose bark and was never as extensive or as cleanly done as the work of the ivorybills. To conclude this installment, we already suspected that Pileateds can and do scale freshly dead sweet gums before the bark has loosened; these images show them doing it in a way that is inefficient and neither ‘extensive’ nor ‘clean’. The total surface area scaled over approximately 30 minutes is modest compared to scaling we suspect to have been done by ivorybills. In addition, PIWO work has some characteristics that may be recognizable upon close examination of the affected limbs and bark chips. The fact that these characteristics can be seen on medium-sized sweet gum limbs, with their relatively thin and only moderately tight bark, suggests that it should be even more evident on larger limbs, boles, and other tighter barked species. More on this and on bark chips in subsequent posts. Detail of lowest part of limb. Chips found under scaled area. 1967 slides taken by Neal Wright of a putative Ivory-billed Woodpecker in Texas are viewable on Vireo (search Ivory-billed Woodpecker), but high resolution scans have not been widely circulated as far as I know. These images were not made public until after the the Arkansas “rediscovery”, more than three decades after they were obtained. Wright’s story is mentioned in Jackson (2004) “Reynard saw the photo and said that it was fuzzy but definitely of a Campephilus woodpecker.” It’s clear from the context that Jackson had not seen the images at the time of writing. When I first encountered the Wright slides, I was skeptical, but after seeing some lesser-known Singer Tract photographs as well as other images of Campephilus woodpeckers in cavities, my opinion started to shift. After finding additional ivorybill photographs in the Cornell archives and in Tanner’s dissertation, I thought it would be worth posting some of those images along with one of Wright’s slides for the sake of comparison. Of course, it’s up to readers to draw their own conclusions, but I think a few things are worthy of note. First, the Wright slides were taken long before the internet, at a time when the only readily available image of an ivorybill in a nest cavity was Tanner’s Plate 1, which is quite similar to Fig. 43b (below). The posture of Wright’s bird is much closer to the ones shown in the then virtually unknown and/or unpublished images, especially those from the 1938 nest. The placement of the cavity is also strikingly similar, just below a major fork. It seems highly unlikely that Wright would have been aware of obscure Singer Tract photographs. While the image quality is too poor to be certain, there appears to be excavation similar to work found on some Singer Tract nest and roost trees to the right of the nest cavity in Wright’s slide. Again, this is a fine detail that would likely have been unknown to Wright and that would have been difficult to fabricate. These are very poor quality images; the malar stripe seems a little too extensive, although this could easily be a function of angle and lighting. As with the Fielding Lewis photographs, which were taken several years later, I have to wonder why anyone intent on committing a hoax wouldn’t do a better job. And in the case of the Wright pictures, it would make more sense if the template for such a hoax would have been Plate 1 in Tanner, rather than photos that were unknown to all but a handful of people, most of them at a northeastern university. Finally, I think the fact that the images were turned over to an ornithologist (George Reynard, scroll down for his obituary) but were kept confidential for so long also tends to support the idea that they’re authentic. Neal Wright may have had an agenda – a desire to protect the area where he took the picture – but the images were not used to serve that purpose. Edited to add: This fascinating article on a recent, non-ivorybill related hoax suggests that it’s not uncommon for hoaxes to be paradoxically uneven in quality, and that hoaxers’ motives can be murky and bizarre. Nonetheless, I think that other factors point to authenticity for both the Wright and Lewis photos. © N. Wright/VIREO USA – Nest with adult protruding, slide mount dated 5/70 (apparently the duplication date). Poorly defined bird is apparently peering out of a cavity in the upper left of the trunk, below the fork. 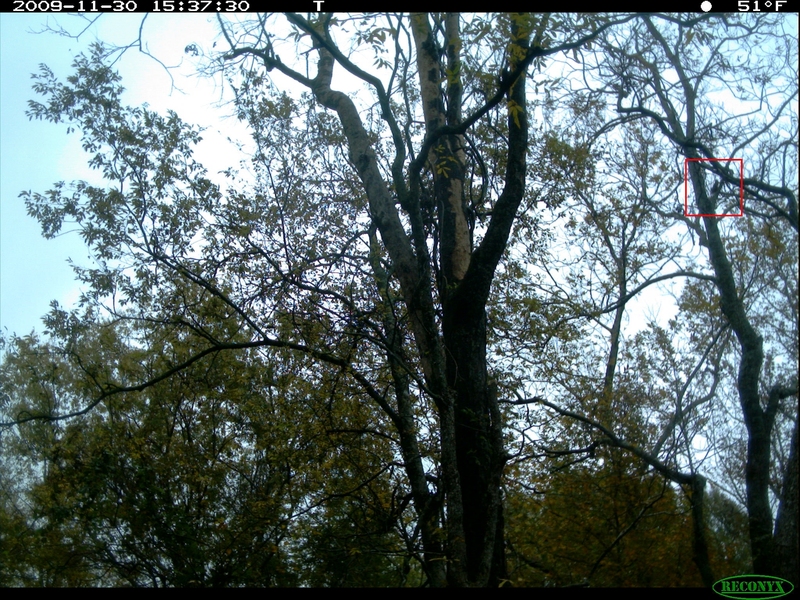 Another item I found in Tanner’s dissertation merits comparison with one of Project Coyote’s camera trap photos, since the tree species involved are the same. Plate 7 in Tanner shows ivorybill feeding sign on honey locusts, but the reproduction in the monograph is very dark. The figure from the dissertation is much brighter, making it clearer what Tanner was attempting to show. I think the similarity to the work on our target tree, where I had a sighting a week prior to the capture, is striking. To enlarge the trail cam photo, click here. a brief description from the monograph: “When Ivory-bills dig, they chisel into the sap and heartwood for borers like other woodpeckers, digging slightly conical holes that are usually circular in cross section (Plate 11)”, and online imagery showing the work of other Campephilus woodpeckers. Material found during my recent visits to Kroch library at Cornell lends some support to the ideas contained in that post, and so does T. Gilbert Pearson’s photograph of a tree that had been fed on by ivorybills. The archival material includes additional images of ivorybill excavation and a considerably more detailed description by Tanner in a document prepared for the Cuban search in the 1980s. The passage includes somewhat more detail on bark scaling than is found elsewhere, but more importantly it describes ivorybill excavations as “hard to distinguish from similar digging by the Red-bellied Woodpecker”. This description may seem counterintuitive to some. Despite my own writing to the effect that ivorybill morphology may lead the species to dig less efficiently than pileateds and my references to targeted digging, I still had an underlying assumption that the size of the bird would correlate with the size of the dig and that ivorybill excavation would often resemble the familiar large furrows dug by PIWOs. While a couple of the holes in Plate 11 and in Pearson’s photograph may well involve the merging of more than one dig, it appears that ivorybill excavations are usually more targeted and that large furrows are not typical. Also of interest for multiple reasons, including the observation of birds scaling very small limbs and of one feeding 5′ from the ground, are Tanner’s field notes from April 3rd, 1937. I’ll let the remaining images of known and suspected ivorybill excavations speak for themselves and will conclude with a few from our search area that seem consistent with known ivorybill work. While I’m nowhere near as confident about this material as I am about scaling, I suspect that finding excavations that are consistent with what ivorybills are known to have done in conjunction with scaling is suggestive. I hope this material will be useful for other searchers. All images from the Singer Tract below are courtesy of the Division of Rare and Manuscript Collections, Cornell University Library. Most of these images were published in Tanner’s dissertation but have not been widely disseminated. And now some examples from our search area that resemble the existing images of known ivorybill excavation. This is not something I’ve focused on, so I’ve probably missed other examples. Image at bottom is a detail of the sweet gum snag above. I suspect that more than one species of woodpecker is involved. There will be one or two more installments in this series, but the next post is likely to be a trip report, probably the last for this season.